Active enantiomer of (RS)-Baclofen. Selective GABAB receptor agonist. Decreases ethanol intake in addiction models. Shows anti-cataplexy actions and promotes sleep. Blood-brain barrier permeable. The GABABB receptor agonist (R)–Baclofen is commonly used at concentrations of 1–50 µM. It can be used to target presynaptic GABAB receptors to inhibit neurotransmitter release. 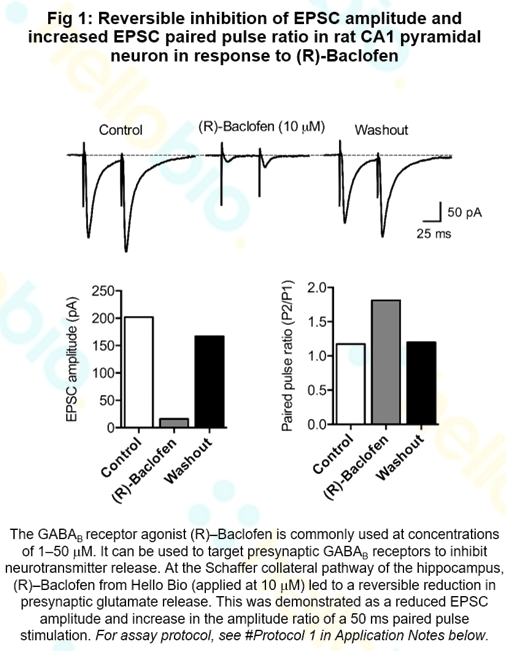 At the Schaffer collateral pathway of the hippocampus, (R)–Baclofen from Hello Bio (applied at 10 µM) led to a reversible reduction in presynaptic glutamate release This was demonstrated as a reduced EPSC amplitude and increase in the amplitude ratio of a 50 ms paired pulse stimulation (see Fig 1 above). Whole cell voltage clamp recordings of CA1 pyramidal neurons from the rat hippocampal brain slice. 50 ms paired EPSCs were evoked via stimulating electrode placed in the CA3 region to stimulate the Schaffer collateral pathway delivering two square (150 µs) pulse with a 50 ms interval every 10 sec at an intensity that gave a reliable EPSC. Neurons were held at -60 mV (the reversal potential of GABA currents). Paired EPSCs were continually stimulated and recorded in response to applications of baclofen until a maximum effect was achieved at which point baclofen was washed out with control solution. EPSC amplitudes were taken from the amplitude of the first pulse and paired pulse ratios calculated by dividing the amplitude of pulse 2 by pulse 1 (P2/P1). Intra-nucleus accumbens shell injections of R(+)- and S(-)-baclofen bidirectionally alter binge-like ethanol, but not saccharin, intake in C57Bl/6J mice. Kasten CR et al (2014) Behav Brain Res 272 : 238-47. Comparative stereostructure-activity studies on GABAA and GABAB receptor sites and GABA uptake using rat brain membrane preparations. Falch E et al (1986) J Neurochem 47(3) : 898-903. GABAB agonism promotes sleep and reduces cataplexy in murine narcolepsy. Black SW et al (2014) J Neurosci 34(19) : 6485-94. 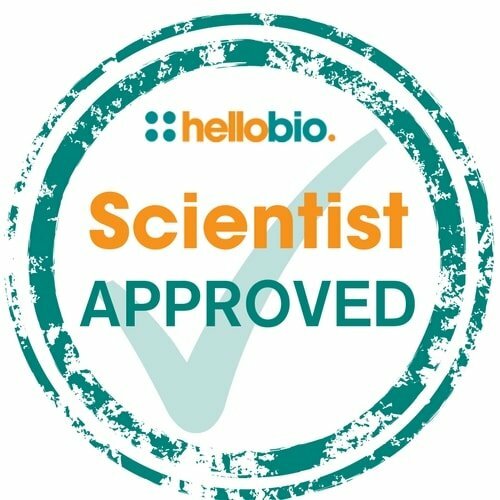 The following papers have cited the use of (R)-Baclofen (HB0952) from Hello Bio. If you have published a paper using this product, and it is not shown here, then please tell us! We will send you a free gift as a thank you! Enhanced Postsynaptic GABAB Receptor Signaling in Adult Spinal Projection Neurons after Neonatal Injury.